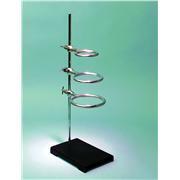 Support rings with clamp, steel rod. 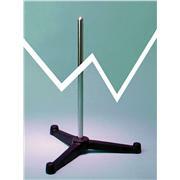 These support stands with rods come complete with a stamped steel base with black enamel finish and a removeable zinc plated steel rod. 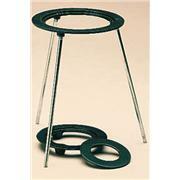 Support rings with clamp, cast iron. 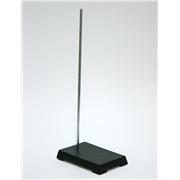 Heavy cast iron triangular bases with black enamel finish include a zinc plated steel rod. 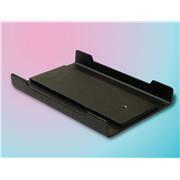 These non corrosive molded support stands provide excellent alternatives to metal ones. Even the metallic rod has a polypropylene covering making it non corrosive. 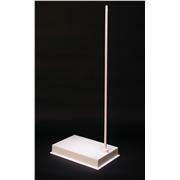 Each support base comes with a 0.5" diameter 30" long rod. 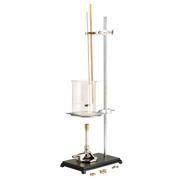 …round bottom flasks, reaction vessels, and other apparatus that requires lower support. 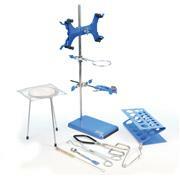 Opening in PVC coated aluminum ring allows for easy removal of sample container. 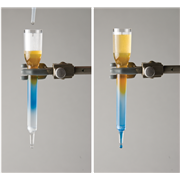 PVC coating protects glassware. 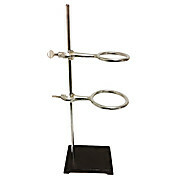 Long extension arm permits depth adjustment of the open ring from the lab-frame or ring stand. 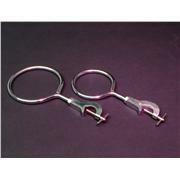 Zinc plated steel extension rings. 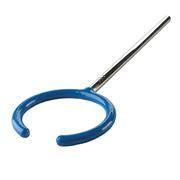 Rod diameter is 5/1", overall length is 12". …5/8" by 5' long. Three threaded holes are in base legs to accommodate rods. 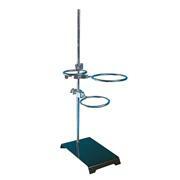 Complete unit consists of Stainless Steel U shaped base, one 5/8 x 5' rod, two 5/8" x 29 rods, three power hold clamps, three 11079-08 Chain Clamps, a modified 7837 Aluminum Support Stand (18" high), and one 11750 Cork Ring. 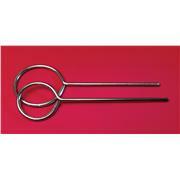 …for up to 5/8in (16mm) diameter rods. 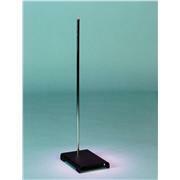 Base dimensions are 19-1/2 x 30in (DxW) with code -48 at 48in height and code -38 at 38 inches tall. Call for custom heights. Not included are our 6442 family of mounting clamps nor our 11177 family of ring supports that must be sized to the supported vessel. 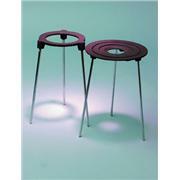 These stamped steel bases feature 2 tapped holes for the rods. Hole at the center of the shorter side is for standard ring stand use. 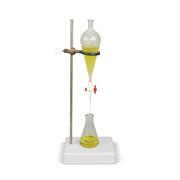 Hole at the center of the longer side is for titrations, specific gravity determinations, etc. 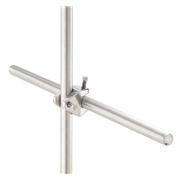 Each base includes a zinc plated steel rod. Cast iron ring with black enamel finish. Detachable zinc plated legs. 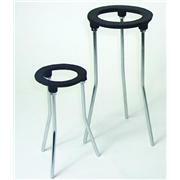 Legs are interchangeable, features removeable rings with 3.5", 4.75", 6.5" Ring O.D., 9" Height. These stamped steel bases feature an added steel plate on the back which makes them about 50% heavier than regular stamped steel bases. 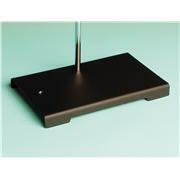 The steel plate also facilitates a sturdier threading of the rod into the base. 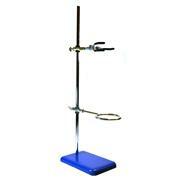 …-150 volts, variable, filtered approximately 1/2 hp.max. 3 amps. A solid state control with rugged control regulation and rectification circuitry. AC and DC work in conjunction. Fwd-Off-Rev. DC control switch only. Fused for AC and DC outputs, 10 amps and 3 amps respectively. Rear ring stand clamp. …for connecting 3/8" O.D. flexible vinyl tubing from pump and reservoir using a 1/4" to 3/8" tubing connector. Normal flow is in upward direction. 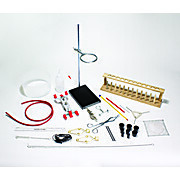 Complete unit consists column, pump, tubing, screen supports, O-ring(s), ring stand, clamp, screen supports, connector and elbow tubes. …supplied with 1.5 meter 3-wire cable for controller connection. Motor is UL & CE rated. Controller: solid state 120v, 10 amp AC max. or 0-120v, 6 amp DC max. Features rear ring stand clamp, Fwd-Off-Rev. switch. Supplied with 1amp fuse and heavy duty 1.8 meter 3-wire power cord with NEMA plug.